The last time my Aunt Polly and I went to 50 Plates we asked about her fav waiter/bartender Evan. To our surprise he had recently left to work at a new restaurant on NE Alberta and 29th. 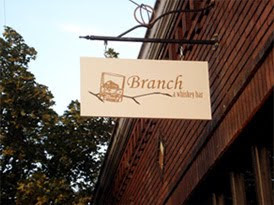 Branch a whiskey bar was opened two months ago by Andrew Finkelman, formerly of both 50 Plates and the Alberta Street Oyster Bar. He brought with him Chef Larry Tavernetti and our waiter Evan. The happy hour, from 5 to 7, offers $5 glasses of house red and white wine, $3 well drinks, discounted beers and $2 off all appetizers and their house ground burger, with house bacon. Ben and Adam joined Polly and I and both ordered the burger. It was was a thick, fresh tasting burger with the option of cheddar or swiss cheese. Polly and I shared the "neighborhood special" written on the black board by the bar. Today it was a fall salad, a baked pasta, squash, and kale dish, and a glass of house wine, we chose white. The best part was the squash in the baked pasta, so good! Finally, for food, we ordered the white bean puree which was good but nothing special. For drinks the boys had happy hour priced PBR ($1.50 pint) with a good glass of whiskey. This is a whiskey bar after all so someone had to order it and it wasn't going to be me! Andrew, with a vast knowledge of whiskey, was able to lead Adam to a nice whiskey selection of Corner Creek ($8) while Ben went for the Booker's ($12). Polly stuck to their house white, the Altozano ($6), which was great. While I chose to test the cocktail menu and order "The Beet Goes On" ($7), a combination of beet infused vodka, lemon juice, and sugar served up. I wouldn't say that it was better than the Ruby at Mint or the beet drink Kelly made at Elephant's, but it was very enjoyable and I wouldn't hesitate to order it again. Finally, my last drink was made by Evan and is known as an Aviator. I did like this gin, maraschino liquor, and lemon juice drink, but I probably would not order it again. Branch offers great drinks, a wide variety of whiskey, an $8 happy hour burger which isn't expensive when paired with a $1.50 PBR and a baseball game (the Yankee's were playing that night). The atmosphere is great and the staff is friendly, but there is no exceptional happy hour deal. Regardless I would definitely check it out if you are ever on Alberta, remember to check the black board for specials! Read more from Andrew here!